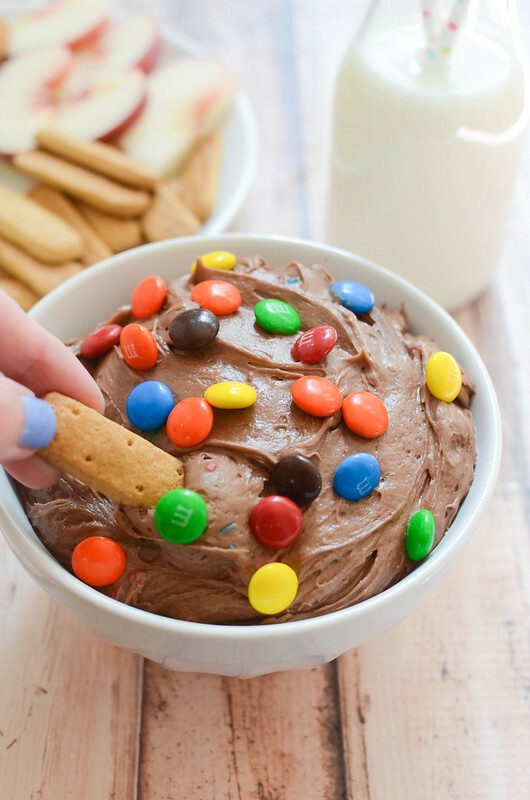 M&Ms Brownie Batter Dip – rich and delicious dessert dip! It starts with boxed brownie mix so it’s quick and easy. Dip fresh fruit or graham crackers! 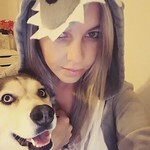 Guess who’s having a birthday! Everyone’s favorite colorful candies, M&M’S®. It’s the 75th birthday! Isn’t that crazy?! They’ve been a long time favorite of mine but I had no idea had been around for 75 years! 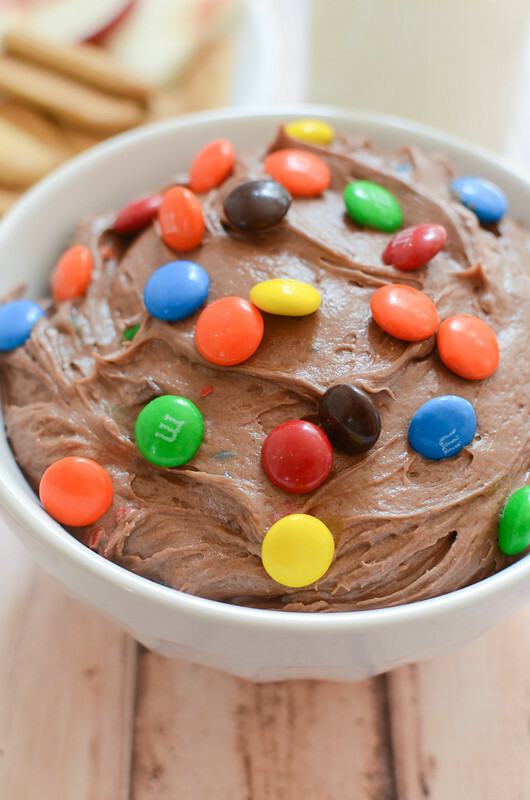 Let’s celebrate the birthday by making a super quick and easy dip with M&Ms sprinkled throughout. More on that in a minute! Are you excited? I’m really, really, really excited. It’s been a long summer and I need a break. But besides that, I also enjoy all the back-to-school festivities. I still love a brand new backpack and box of crayons. And I even get excited about packing lunches for the first few weeks! 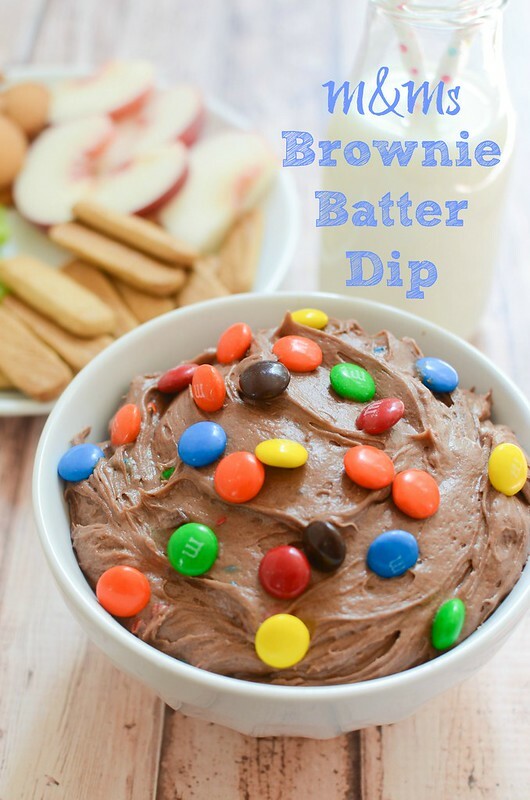 I picked up several bags of M&Ms at Kroger recently to create some fun after school snack recipes like this M&Ms Brownie Batter Dip! 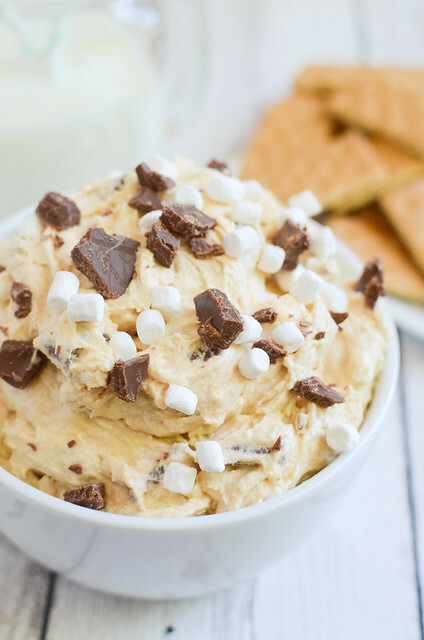 You know I love a sweet dip. This is perfect for dipping apple slices or banana slices or strawberry are really delicious in it! Or, graham crackers and vanilla wafers! So many options. It’s actually really easy to make, too. You just beat together some softened cream cheese and butter and then mix in a bit of boxed brownie mix. Drizzle in some milk until it reaches the desired consistency and then stir in chopped M&Ms. 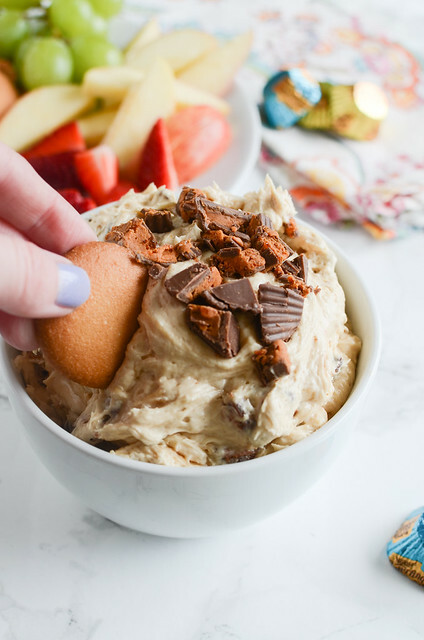 The M&Ms provide the perfect crunch in an otherwise very smooth and creamy dip. 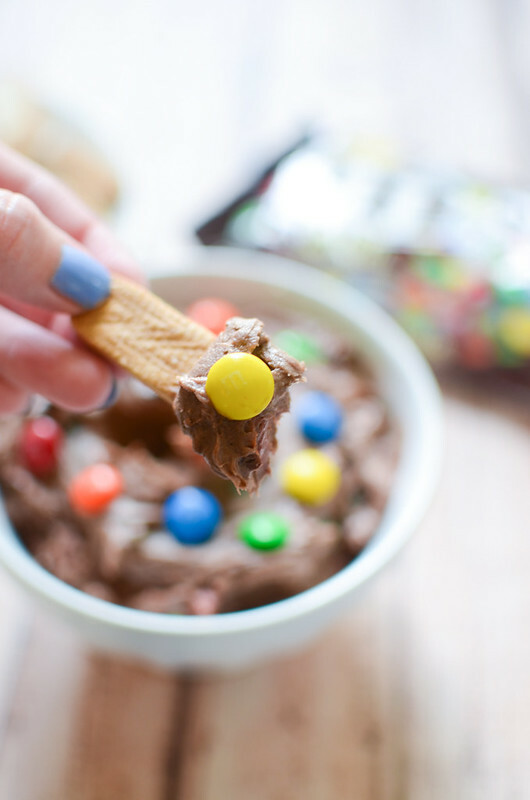 Don’t have time to bake your own M&Ms goodies? Head over to your Kroger or Kroger banner store bakery to find delicious freshly made M&M cookies. Those are my favorite because they’re soft but not super soft and they are just scrumptious. Kroger knows how to make a good M&Ms cookie. Use the store locator to find a Kroger or Kroger banner store near you where you can find your own M&Ms or M&Ms cookies! And let me know in the comments what your favorite M&Ms variety is! Crispy? Peanut? Plain? Peanut Butter? I almost always go for peanut but every once in awhile, I get a crazy craving for the peanut butter! Let’s be real, I love M&Ms any way I can get them. In the bowl of a stand mixer fitted with a paddle attachment, beat butter and cream cheese together until smooth. With the mixer on low, slowly add in brownie mix. Add milk until it reaches the desired consistency. Use a rubber spatula to stir in the chopped M&Ms. Transfer to the serving bowl and sprinkle with more M&Ms. 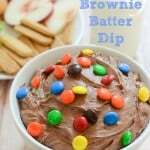 4 Responses to "M&Ms Brownie Batter Dip"
I’m thinking a bowl of this and a good movie would be a very, very good thing! I’d love this!!! 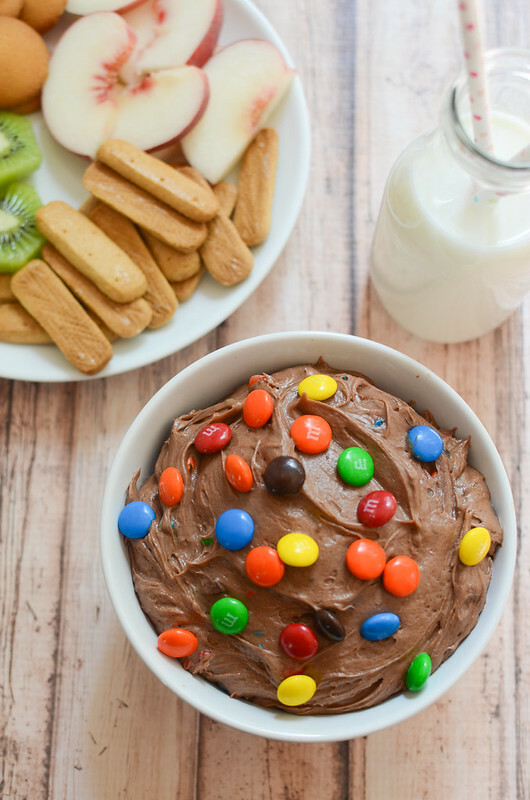 The dip looks so good, plus the m&m’s on top are fun add to it. Are spoons and/or fingers acceptable? This looks FANTASTIC! We made something like this for my future sister in law’s bridal shower the other weekend! so good!